The Templar is the main tanking class of Aion with many defense increasing skills that allow for the Templar to achieve a nearly invincible state for a period of time. 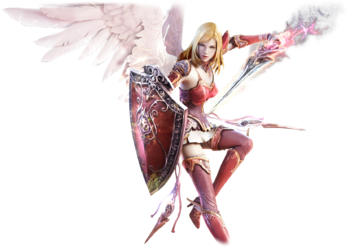 The Templar is the main tank based class in Aion and as such, most Templar skills are focused on increasing defense, controlling aggro, and mitigating damage. Due to this, the Templar is lacking in high damage skills and is considered to have one of the lowest DPS rates in Aion. Templars are very limited in the weapons they can wield and usually wield a sword or mace and shield combination with a greatsword as backup. The choice to use a sword or mace is often decided by a Templar’s stigma skill set. If a Templar is equipped with magical skills (Magic Smash I <Magic Smash I> or Divine Justice I <Divine Justice I>), a mace is used, as the magic boost provided by a mace can usually double the damage dealt by magical skills. If a Templar does not use magical skills, a sword is usually used, as swords have a higher critical hit chance and have a slightly faster attack speed. A greatsword is usually found in a Templar’s weapon set as well, as Templars, much like gladiators, have little trouble in tanking mobs without the use of a shield. While greatswords do more damage than a sword or mace and shield combination, many of the Templar’s shield skills are only usable with a shield and as such, the weapon used is usually left to the player’s preference. In solo play, Templars are usually very slow to kill mobs. At lower levels, every other class has higher DPS than a Templar. However, as a trade off, the Templar usually takes very little damage from the mobs as well. So while a Templar can grind very well, they do it very slowly. In group play, Templars excel at holding aggro and positioning mobs with their use of the Doom Lure I <Doom Lure I> skill. Templars have the most aggro generation skills, active and passive, of all classes and are very effective in holding aggro against any kind of DPS. This, coupled with their plate armor and skills that allow for high survivability, make the Templar a worthy tank for any of the bosses in the game. In solo PvP, the Templar wins by outlasting their opponent. With the ability to completely regenerate all their HP instantly, Templars can get something of a “round 2” chance at their opponents. Templars also have many skills to mitigate or even negate physical and magical attacks against them, which make any battle against a Templar a long and hard fought one. However, being the sturdiest melee class, Templars are often kited by all of the other classes when their defensive skills are up. While they can fight very well against melee classes, Templars do have some problems with ranged classes as they can be kited until the duration of their defensive ability runs out. In group PvP, Templars apply pressure on an enemy group by harassing enemy back-lines. Templars can use Inescapable Judgment to pull in enemies which can then be easily focus fired by his group. Also, in group PvP scenarios, Templars are generally left ignored, or if possible CC’d, as it would take too much time to focus down a Templar. Using this behavior to their advantage, Templars are then free to overextend in group engagements, as their repertoire of survival skills usually allow them to survive even the worst of focus fire from the entire enemy team and successfully apply pressure to enemy healers or casters, by either interrupting their abilities through the use of various shield stuns or by using a greatsword to damage and knockdown their targets. If need be Templars can also serve a defense role in group PvP through the use of their Bodyguard I <Bodyguard I> stigma skill, which allows the Templar to take all of the damage taken by a single group member. The templar is a tank with incredible survivability but has less dps relative to other classes. It is recommended that you group up as much as possible when playing a templar. In PvE, acquiring a good weapon is recommended before acquiring good armor, as templars can usually get by with their naturally high HP pool and their many skills to supplement their armor and negate damage. Having a good weapon will also increase the amount of aggro gained and allow templars to hold their targets more easily, while at the same time increasing their very low dps. In most PvE situations, templars can easily tank while wielding a greatsword to increase their dps. In PvP, Templars require excellent gear to be viable, as having any subpar gear will have devastating consequences. Having a subpar armor set will ultimately make the templar a much softer target that is prone to focused fire. However, having a subpar weapon and accessories will result in the templar being unable to apply pressure or do any significant damage which will lead to them being ignored or CC’d. Class SummaryThe Templar is the main tanking class of Aion with many defense increasing skills that allow for the Templar to achieve a nearly invincible state for a period of time.Play StyleThe Templar is the main tank based class in Aion and as such, most Templar skills are focused on increasing defense, controlling aggro, and mitigating damage. Due to this, the Templar is lacking in high damage skills and is considered to have one of the lowest DPS rates in Aion. Templars are very limited in the weapons they can wield and usually wield a sword or mace and shield combination with a greatsword as backup. The choice to use a sword or mace is often decided by a Templar’s stigma skill set. If a Templar is equipped with magical skills (Magic Smash I <Magic Smash I> or Divine Justice I <Divine Justice I>), a mace is used, as the magic boost provided by a mace can usually double the damage dealt by magical skills. If a Templar does not use magical skills, a sword is usually used, as swords have a higher critical hit chance and have a slightly faster attack speed. A greatsword is usually found in a Templar’s weapon set as well, as Templars, much like gladiators, have little trouble in tanking mobs without the use of a shield. While greatswords do more damage than a sword or mace and shield combination, many of the Templar’s shield skills are only usable with a shield and as such, the weapon used is usually left to the player’s preference.PvE In solo play, Templars are usually very slow to kill mobs. At lower levels, every other class has higher DPS than a Templar. However, as a trade off, the Templar usually takes very little damage from the mobs as well. So while a Templar can grind very well, they do it very slowly.In group play, Templars excel at holding aggro and positioning mobs with their use of the Doom Lure I <Doom Lure I> skill. Templars have the most aggro generation skills, active and passive, of all classes and are very effective in holding aggro against any kind of DPS. This, coupled with their plate armor and skills that allow for high survivability, make the Templar a worthy tank for any of the bosses in the game. PvP In solo PvP, the Templar wins by outlasting their opponent. With the ability to completely regenerate all their HP instantly, Templars can get something of a “round 2” chance at their opponents. Templars also have many skills to mitigate or even negate physical and magical attacks against them, which make any battle against a Templar a long and hard fought one. However, being the sturdiest melee class, Templars are often kited by all of the other classes when their defensive skills are up. While they can fight very well against melee classes, Templars do have some problems with ranged classes as they can be kited until the duration of their defensive ability runs out.In group PvP, Templars apply pressure on an enemy group by harassing enemy back-lines. Templars can use Inescapable Judgment to pull in enemies which can then be easily focus fired by his group. Also, in group PvP scenarios, Templars are generally left ignored, or if possible CC’d, as it would take too much time to focus down a Templar. Using this behavior to their advantage, Templars are then free to overextend in group engagements, as their repertoire of survival skills usually allow them to survive even the worst of focus fire from the entire enemy team and successfully apply pressure to enemy healers or casters, by either interrupting their abilities through the use of various shield stuns or by using a greatsword to damage and knockdown their targets. If need be Templars can also serve a defense role in group PvP through the use of their Bodyguard I <Bodyguard I> stigma skill, which allows the Templar to take all of the damage taken by a single group member. Ending NoteThe templar is a tank with incredible survivability but has less dps relative to other classes. It is recommended that you group up as much as possible when playing a templar.GearIn PvE, acquiring a good weapon is recommended before acquiring good armor, as templars can usually get by with their naturally high HP pool and their many skills to supplement their armor and negate damage. Having a good weapon will also increase the amount of aggro gained and allow templars to hold their targets more easily, while at the same time increasing their very low dps. In most PvE situations, templars can easily tank while wielding a greatsword to increase their dps.In PvP, Templars require excellent gear to be viable, as having any subpar gear will have devastating consequences. Having a subpar armor set will ultimately make the templar a much softer target that is prone to focused fire. However, having a subpar weapon and accessories will result in the templar being unable to apply pressure or do any significant damage which will lead to them being ignored or CC’d. « How much Accuracy do you need for Infinity Shard instance?